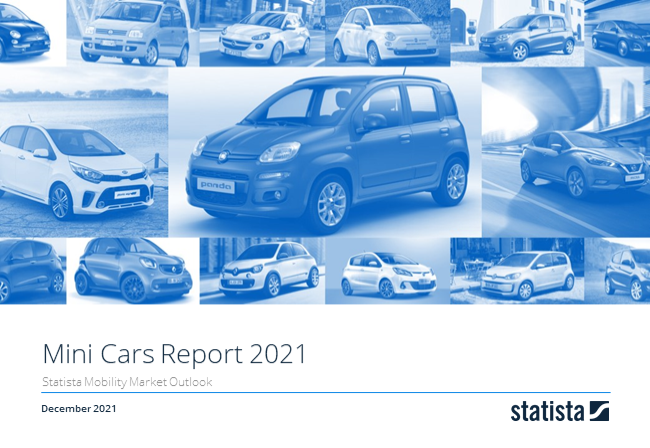 Revenue in the Mini Cars market segment amounts to US$1,228m in 2019. From an international perspective it is shown that most revenue is generated in Italy (US$6,709m in 2019). The Mini Cars Market segment includes economy passenger cars of an average footprint around 3.35m2 (36 ft2), an average mass around 1000kg (2250lbs) and passenger/cargo volume less then 2.4m3 (around 85 ft3). While considered to be the market with the most inexpensive models, prices in the mini cars segment tend to be comparable to those in the small cars segment. This segment originated in the time of the great depression when a need for smaller and more affordable passenger cars arose while the aftermarket for larger and more expensive models experienced a severe slump. Mini cars continued to be marketed as inexpensive, driving their sales up in Europe after the Second World War, but with each coming generation and a newly found economic prosperity, they were being slowly replaced by larger models. Nevertheless, mini cars got their comeback in the late 1980’s and the early 1990’s caused by the growing urban population and a desire for smaller, more practical four-seat or two-seat city cars. With many manufacturers moving towards this market (mostly by updating their previous, rebranding existing models) an average price of a mini car varied until they finally settled around those of a small car. In recent years manufacturers like Opel and FIAT have been marketing design oriented and highly connected cars like the Opel Adam and the FIAT 500 which are turning around the diffusion of innovation pyramid and have become a huge success among young, tech-savvy urban buyers. Example Models: Citroën C2, Daihatsu Sirion, Fiat 500, Fiat Panda, Hyundai i10, Kia Picanto, Mini Cooper, Nissan Micra, Peugeot 107, Renault Twingo. Reading Support Revenue in the Mini Cars market segment amounts to US$1,228m in 2019. Reading Support In the market for Mini Cars, volume is expected to amount to 109.7 t cars by 2022. Reading Support The average price per unit in the market for Mini Cars amounts to US$14,985 in 2019. Reading Support With a market volume of US$6,709m in 2019, most revenue is generated in Italy. Here you can find more studies and statistics about "Mini Cars".